Frank Greaves, the lead author presented the potential and some of the learnings, on how CLTS, as a community-based collaborative approach to sanitation behavioural change, can be applied successfully in contexts of fragility and displacement, leading to communities more convinced and prepared to maintain and develop safe sanitation practices. The presentation was followed by a question and answer session. Frank Greaves has worked in the role of WASH Lead for Tearfund since 2007. His key interest is in the application of WASH approaches which are sustainable throughout the Relief-to-Development continuum. Do you have relevant experience to share? Please contact us or join the discussion in the comments section below. 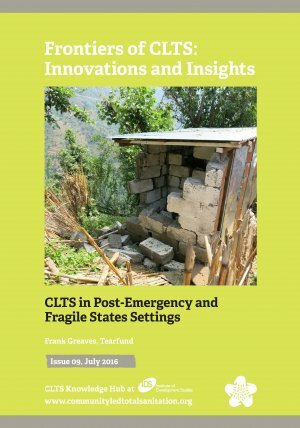 If you have experience of working with CLTS in a post-emergency or fragile state setting, please do share here. Alternatively, if you have documented your experience, please send materials to us by email. Please feel free to pose questions here as well and to anwer other people's questions.